eat sleep cuddle. 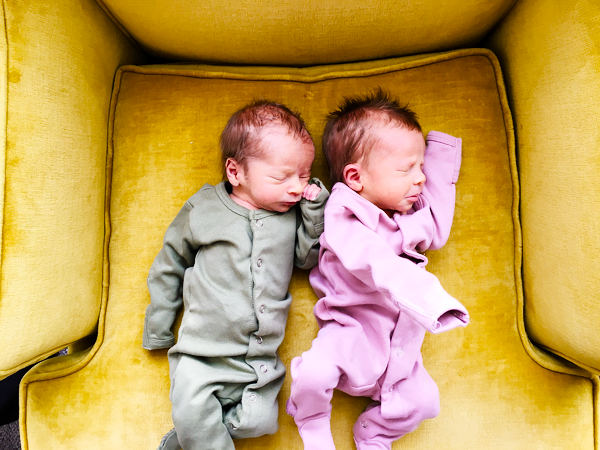 : a twin birth story. It's hard to believe our babies have already been here a week. 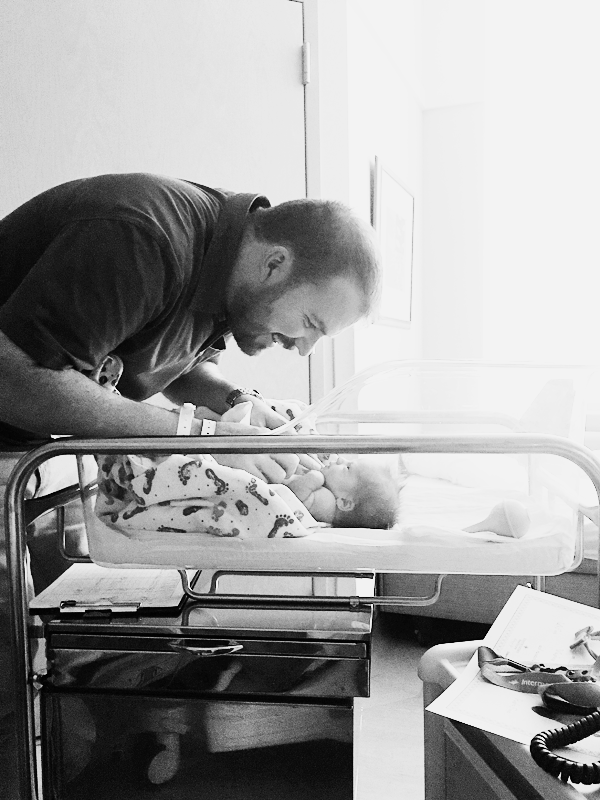 It's been such a blur, the past seven days, but this new stage in our family's life has already been so beautiful. Being pregnant with twins felt a whole lot like being pregnant with just one baby, at least for the first 6 or 7 months, I would say. I was definitely growing faster & bigger, and felt more movement from the babies, but everything else in my body felt the same as it did when I was pregnant with Wyatt. I loved being pregnant with Wyatt, and I really loved being pregnant with twins this time around, up until the last month or so of the pregnancy when things started getting real. Ha. (and by real, I mean...very uncomfortable.) I noticed at night my ankles would swell up big time if I had been around a lot that day, which was totally fine because it wouldn't become obvious until about 8pm at night and didn't interfere too much with my normal life. I would wake up and my ankles would be back to normal size. Bit by bit, though, the swelling took over my feet, calves, eventually my knees and thighs, and even my lower abdomen, and never seemed to go down when I woke up in the morning. Over a few weeks, the edema (swelling) was just really out of control and really uncomfortable and the only thing I could really wear was my trusty gray maxi skirt, and in the last week or so before the babies came, all that I could fit my chubby feet into was my Nike sneakers. Maxi skirt and sneakers is not my usual outfit of choice, so basically I tried to stay home as much as possible haha. My doctor was not concerned about it in the beginning because my blood pressure and everything else was still the same, but near the end at my doctor's appointment they noticed my blood pressure had gone up and there were traces of protein in my urine (tmi, sorry?) and that I had mild preeclampsia. They set an induction date for 10 days later and told me to just get more rest and drink lots of fluid, and had me set up appointments to take non-stress tests. The following week I had a non-stress test where they took my blood pressure (still high, but at least had not gotten any higher) and a little more protein in my urine. Then the following day had an appointment with my OB—blood pressure still high, a lot of protein in my urine (double from the day before), and bloodwork that showed my "mild" preeclampsia had turned to "severe" preeclampsia basically overnight, and that I would have to be induced that day (about 5 days earlier than the previous date we had set). Once we got to the hospital, they took us to our room and started getting my hooked up to all kinds of stuff. First the fetal heart rate monitors, which is such a chore for nurses for some reason. (It always took them for.e.ver to get both babies heart rates.) I also had to be given an IV of antibiotic, magnesium sulphate (for the preeclampsia), the pitocin, and eventually a catheter (haha sorry, this is getting so personal!!) to keep close track of my urine output for preeclampsia reasons I guess. The IV of antibiotic and magnesium was given to me around 4pm and the plan was to let that stuff work in me until 8pm when I would get another dose of antibiotic and the doctor would break my water. After getting the IV at 4pm, I guess I could kind of feel the pitocin working. I had to stay laying in bed because of the heart rate monitors (so annoying). It is mandatory with twins to have constant heart rate monitoring..with Wyatt I had intermittent which was a lot nicer. I listened to my meditations and just tried to stay relaxed while the contractions started. During my pregnancy I had kept telling my doctor I was really wanting to have these babies unmedicated, since I did that with Wyatt and had such a wonderful experience. She said that was fine, but did explain to me a lot of the risks involved by not getting an epidural with a twin delivery. Like if baby B had to be delivered by C-section, I would have to be put completely out, or if baby B required a breech extraction (which he did...more on that later), she would have to do a breech extraction—put her arm up into me (yikes) and pull him out ,which can sometimes be too much for some women and cause them to go C-section. When it came down to it, that late in my pregnancy I was just so uncomfortable in general with my swollen legs and and truth be told, I was a little wary about the breech extraction stuff she would most likely have to do. So between 4-8pm I laid in bed, meditated and stayed relaxed as best I could. The time didn't pass slowly or quickly, I don't think. It just kind of passed and I was doing fine. At 8pm the doctor came in and we decided I would get the epidural before she broke my water, since after my water breaks, chances were that things would go pretty quickly. So the anesthesiologist came in and gave me the epidural, and OUCH! I did not like having that thing put in!! 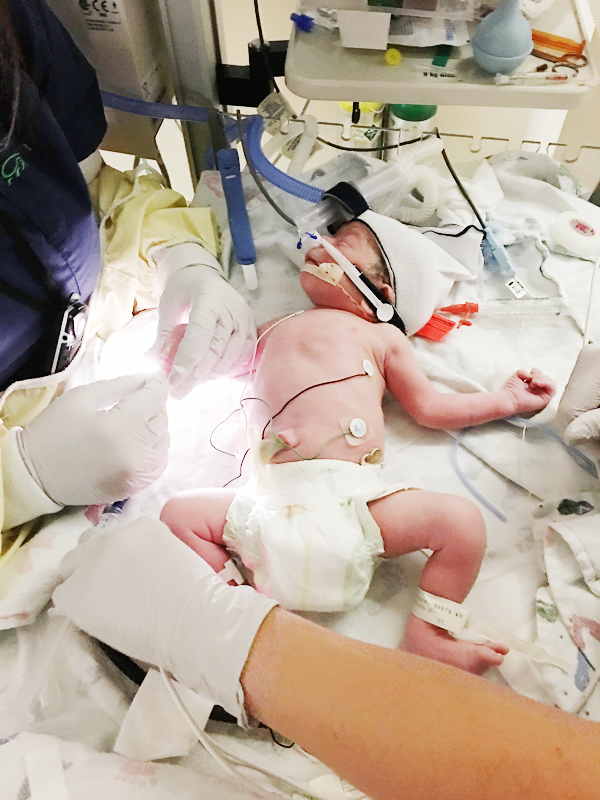 I had heard horror stories of women having negative reactions to epidurals, so I was terrified that would happen to me. Luckily it didn't, but I was still surprised so many women are so willing to get those things since they are not really that painless. Anyways, I got the epidural and could feel pretty quickly the contractions lessen, and I could still feel & move my legs. At 8:30pm my doctor came in and broke my water. Kind of uneventful I suppose. After getting the epidural I started getting really drowsy and unmotivated and apathetic about the whole ordeal, to be honest. Ha. It sounds strange, but I just felt really out of it. The epidural took away the pain, and also any adrenaline I had had. It was really weird and very different than how I felt with Wyatt's delivery. So she broke my water and then I laid there for another hour or so just really tired and wanting to take a nap. Around 9:30-10pm the nurse checked my cervix and said I was still at 3cm. I didn't think too much of it, although I do remember having the thought that this was all kind of dragging on longer than I was expecting. I thought pitocin was supposed to make things go faster? Finally at about 10:30pm I started feeling a lot more pressure and discomfort all of a sudden. I mentioned it to the nurse in my groggy state and she asked if it felt like bowel movement pressure, which it did, so she checked my cervix again and I was fully dilated to 10cm (which happened all within about about 30-40 minutes! finally things were happening!). At that point things started really moving. I think they were a little alarmed I had dilated to quickly, so they hurried & wheeled me into the operating room (this hospital requires that twin deliveries happen in the operating room in case of emergency C-section), and got me all set up and ready to deliver these babies! We weren't in the OR for very long before they let me push baby A out. I think I only did 2 or 3 pushes and Junie came out (5 pounds, 6 ounces). 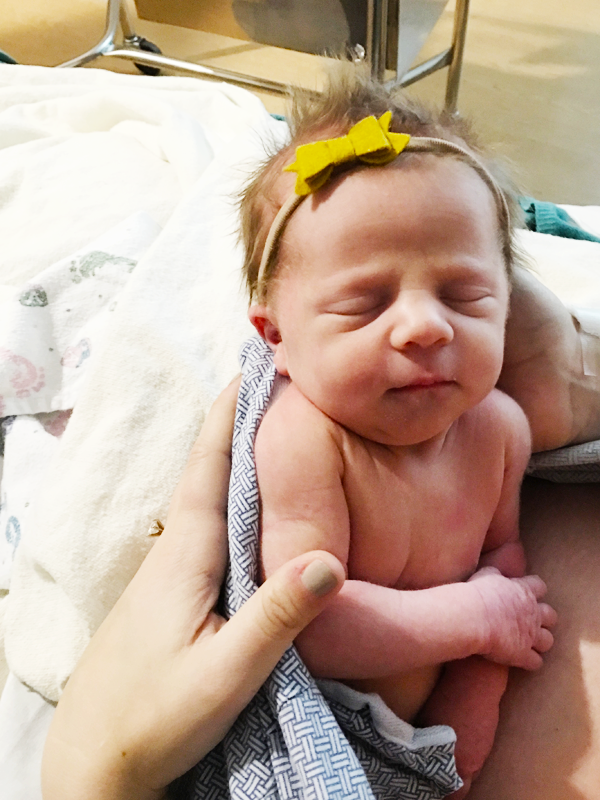 I was already told that I would unfortunately not get the chance to have immediate skin-to-skin, since there was another baby to push out. So I saw her and then they took her over to clean her up and whatever else they do. As soon as she was out they were basically having me push again for baby B. Baby B was still breech though, so I think I pushed once or twice and the doctor went ahead with the breech extraction. 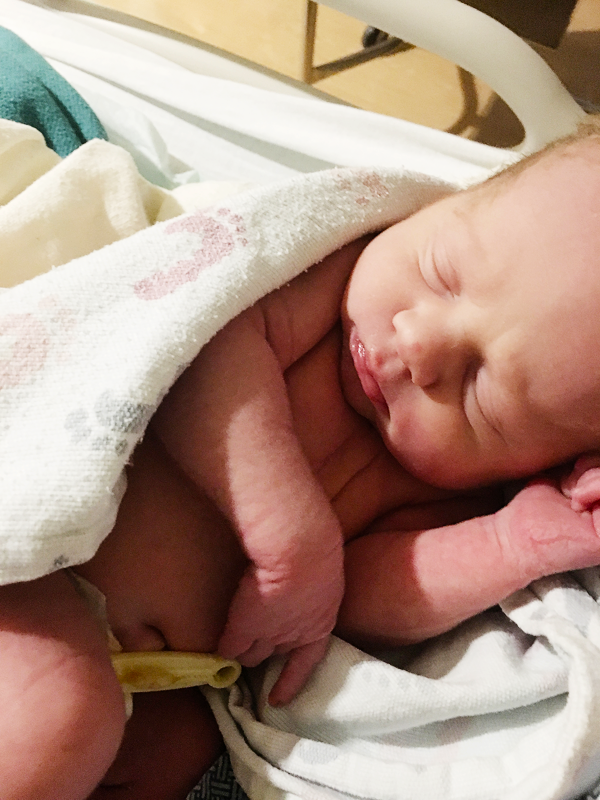 She stuck her hand up my you-know-what and pulled Cal out—he was born 3 minutes later (5 pounds, 13 ounces). Cal actually had the cord wrapped around his neck and he only got a 6 on his initial Apgar, so they were worried about his oxygen/CO2 levels or something...I'm actually not positive. All I know is they had to hook him up to all kinds of stuff and he went to the NICU and I barely even saw him until the next day. After Cal was delivered, they cleaned me up a bit and took me back to my room. They brought June to me before not too long, and I got to hold her for the first time finally. She was so sweet and tiny (and healthy!) and I was so happy to finally get to hold her. Aaron was with Cal in the NICU for probably almost an hour (it seemed like a really long time), so it was just me and my Junie girl (and the nurse) in the room. I nursed June and she did amazing right away. I was so impressed! I started shaking pretty uncontrollably pretty quickly after too. I was trying so hard to stop shaking (since I was holding a brand new baby!!!) but I just couldn't. The nurse didn't seem to think it was much of a problem though, so whatever. I think I asked for like 100 more heated blankets to put over my shoulders. Those felt so good. Aaron finally came back and I gave June to him because I was stiiiiill shaking. I didn't shake at all with Wyatt, but I guess it's fairly common? Anyways, that night they took me to my recovery room where we spent the rest of our hospital stay. 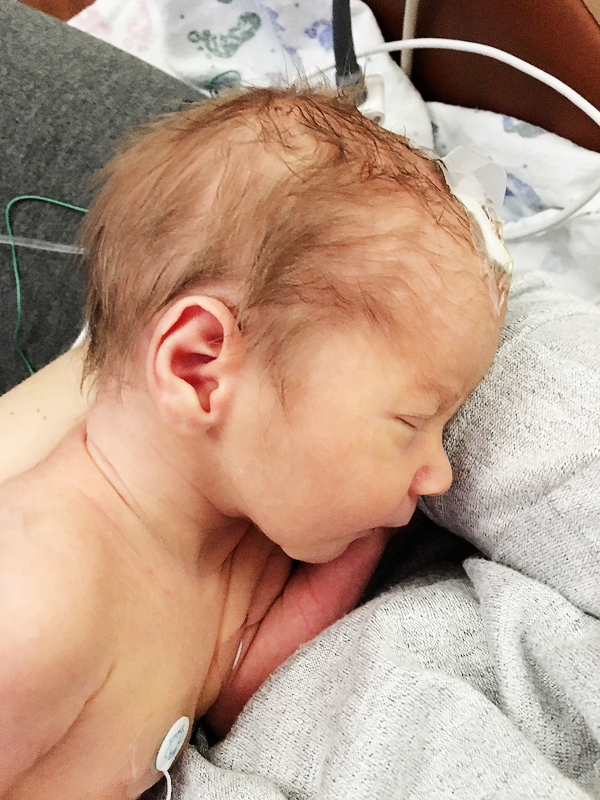 The reason Cal was sent to the NICU ended up being a non-issue. He did completely fine when they took him off the oxygen, but since he had that mask on they knew he wouldn't be able to eat, so they gave him an IV of dextrose to keep his blood sugar levels stable. So to get him out of the NICU we had to wean him off the dextrose, which was just a matter of him learning how to nurse well enough that they felt comfortable sending him home. They were born the night of November 25th, and we went home on the afternoon of November 29th. Looking back on it now, I realize that's a pretty short NICU stay. Although at the time I had a really really hard time with it. On day 3 I had a major breakdown because a NICU nurse told me Cal might need to stay for another couple weeks (I know she was helping me not get my hopes up, but man it really ruined me). Luckily June was perfectly fine, so we got to keep her in our room with us. During those few days it was pretty tricky nursing them both, but separately. I knew I wanted to give breastfeeding a good shot, which all the nurses were very supportive of. During the day I was just going back & forth basically from our room to the NICU, and at night I would feed June, sleep for about 45 minutes, then go down to see Cal to spend time with him and feed him (it helped him eat better if I was there a little bit before he needed to eat). Then I would come back up, maybe catch another power nap, then feed June, sleep 45 minutes, and repeat the rest of the night. It was pretty rough. I was really burning the midnight oil, and of course I was exhausted but I must have been on that post-partum high still, or just figured I didn't have much of a choice. They let Cal start weaning off the dextrose on the morning of day 3 I think, and it took about 24 hours to get him completely off it, and another couple feedings just to make sure things were all okay. Finally when they told me on the morning of day 4 that we could go home that day I seriously had never been so relieved and happy in my whole life. I wanted SO badly to go home, to see Wyatt, and to have the twins and our whole family together for the first time. We came home on a Sunday afternoon and it was sooooo so so so so so wonderful. Wyatt had grown 5 inches and gained 20 pounds while we were gone, I swear, and the twins finally got to snuggle up together for their first time since being in utero!! It was a happy, happy day. Recovery was pretty normal I guess, until about day 7. My post-partum bleeding had gone down like it's supposed to, but then around day 7 it got bright red again and a little heavier. I didn't think too much of it, but I did do a little research on hemorrhaging just in case it happened. (I wanted to be able to identify it quickly since I know it can be pretty serious.) And sure enough....on day 10 I was sitting on the floor playing with Wyatt and when I stood up I felt it. And by "it" I just mean lots of blood pouring out of me!! I went straight to the bathroom and I won't go into all the details, but I was definitely hemorrhaging. I called my OB right away, and we decided I would just go to the ER because it didn't seem to be letting up any time soon. LUCKILY, my mom was already at our house and Aaron & I were able to leave right away. We got to the ER and blood was just still pouring..... It was disgusting and I was kind of a wreck. They got me to a room immediately and tried for what seemed like forever to get the bleeding to stop. It was the only time in my life I thought I might die. (Ha!) I don't think I was close to dying, since I didn't even need a blood transfusion or anything, but the doctor was kind of having a hard time getting the bleeding to stop and it wasn't any minor hemorrhage by any means. But anyways, they finally got the bleeding under control and then took me to the OR to do a (suction) D&C. Next thing I know I'm waking up in the recovery room and again with the shakes. Lots & lots of heated blankets again. They took me to the maternity ward to another recovery room and stayed there the rest of the day. (We got to the ER around 10:30am I think, and came home around 7pm.) They checked up on me and made sure things were all good before sending me home. Everything turned out to be fine, but I was a little shaken up by it. I still cringe when I think about it, to be honest. I don't tell this part of the story to scare anyone that is pregnant, because most likely it will not happen to you....but just be sure to do a little research and be aware of the signs! The pregnancy, delivery, and recovery is all behind me, and now it's just smooth sailing! ;) People always ask me what it's like to have twins, and I always say the same thing...it's easier than I was expecting! I think that last month of the pregnancy was just soo uncomfortable that having to take care of two babies is just a lot easier, because at least I can move around! Also, the babies are just so cute and sweet and I'm nothing short of obsessed with them, which just makes it all that much enjoyable. I really do love being a mom. There is literally nothing else I would rather do. And this whole twins thing has just taken it to a whole new level! It feels like I am doing this all for the first time, since it's such a different experience than when I had Wyatt. I am just so grateful. I know I mentioned how hard that last month of the twin pregnancy was, but honestly I would do it all again in a heartbeat knowing what was on the other side (my beautiful twin babies!). If there's any interest, maybe I'll do a couple more blog posts on twin topics like breastfeeding or sleep schedules or something. Not that I'm an expert by any means, but it's nice to read others' experiences. Cal is actually not a great sleeper (like at all), so if I had to choose, that would be the hardest part of all this. I probably get about 3-6 hours of interrupted sleep on any given night, but I'm just so used to it now that I really don't feel that tired (although I'm sure by any definition I am terribly sleep deprived!). Wyatt's been an amazing big brother and loves to be involved. I'm convinced these are the best years of my life and thank my Heavenly Father every day for this beautiful family I've been blessed with. They are everything to me.